From the Hancock County Courthouse, go southeast on Hwy 15 for 0.3 mile to the fork at the Sparta Baptist Church. Stay right at the fork and continue on Hwy 15. Travel 9.5 miles to Balerma Church Rd. Turn right and travel 3.0 miles. 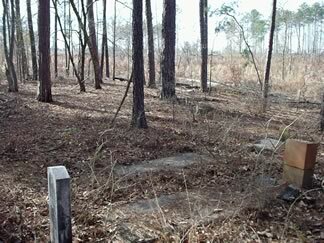 The cemetery is in the woods on the left of Balerma Church Rd, about 200 yards from the road. On private property (Wood Co. land). Birth year per family records (per Glen Cook). Co. E, 3rd Ga. State Troop. Death month, year per family history. Possibly buried in this grave. She is buried in this cemetery, per Ossie Cook. What is left of a wooden marker helps to mark the grave. At least 3 sunken spots, with more graves possible.